They’re back! By popular demand! One show only! 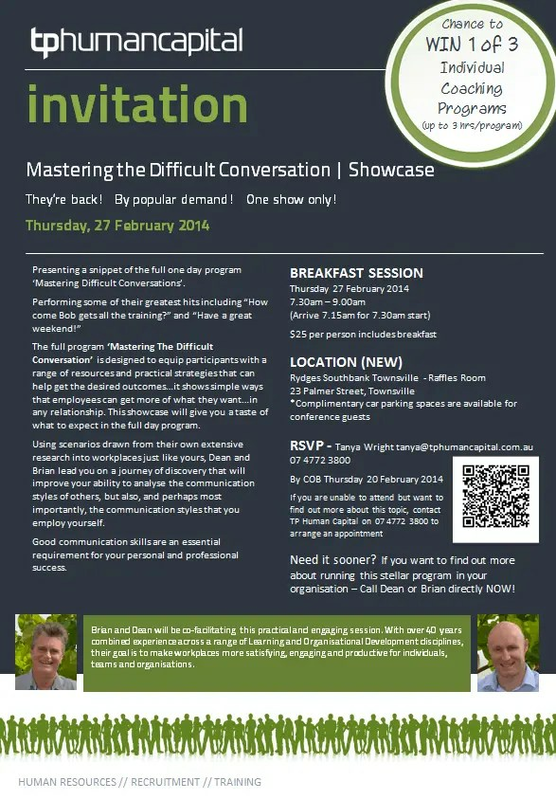 Presenting a snippet of the full one day program ‘Mastering Difficult Conversations’. The full program ‘Mastering The Difficult Conversation’ is designed to equip participants with a range of resources and practical strategies that can help get the desired outcomes…it shows simple ways that employees can get more of what they want…in any relationship. This showcase will give you a taste of what to expect in the full day program. Limited spaces are available, secure your seats NOW!. Contact Tanya Wright via email [email protected] or phone 07 4772 3800 or click here to complete our Booking Confirmation Form. Need it sooner? If you want to find out more about running this stellar program in your organisation – Call Dean or Brian directly NOW!